A very warm welcome to Hill View Primary School. My name is Victoria Buckland, and I have the very great privilege of being Head Teacher of our fantastic community. Hill View Primary provides a happy, secure and stimulating learning environment with your child at the centre of the experience. Your child will develop a love of learning with us. Their creativity, independence, self-discipline and respect for themselves, others and for our world will flourish with our support. They will learn to work and play with others, to share, to observe rules made for the common good, and to make decisions for themselves. We provide a rich, broad and balanced curriculum which will support your child in reaching their full potential as responsible, confident members of a multi-cultural society in an ever-changing world. Our staff, and the facilities we have, encourage all children to be successful and aspire to fulfil their dreams. 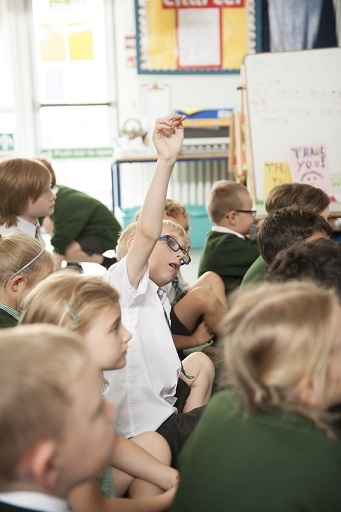 Our highly trained teaching team know that it is vital to recognise each individual child’s talents then support, work alongside and encourage them to recognise and develop their own strengths. Our high expectations at Hill View Primary lead to high achievement. Your child’s development is influenced heavily by both school and home life: the activities of one will be reflected in the other. I strongly believe that by working together, we can fully meet and exceed the educational needs of your child. At Hill View Primary, every individual member of the community commits to ‘Reach for the Stars’ by fully taking part in all that the school offers.